The holidays or special events are very challenging for some people to remain abstinent. It is tempting to take a holiday FROM recovery. However, we have to get to the place where no matter what is going on around us or within us, we continue to maintain our abstinence. Following our program when on vacation or at special events is an act of self-love that is essential to our well-being. Similar to traveling on an airplane with young children: when in danger, put your oxygen mask on first, then put one on your children. This is not selfish. If we want to take care of our loved ones, we need to take care of ourselves first. First things first: focus on the true meaning of the holiday or event. It’s not about the food. It’s about being with people and celebrating life. 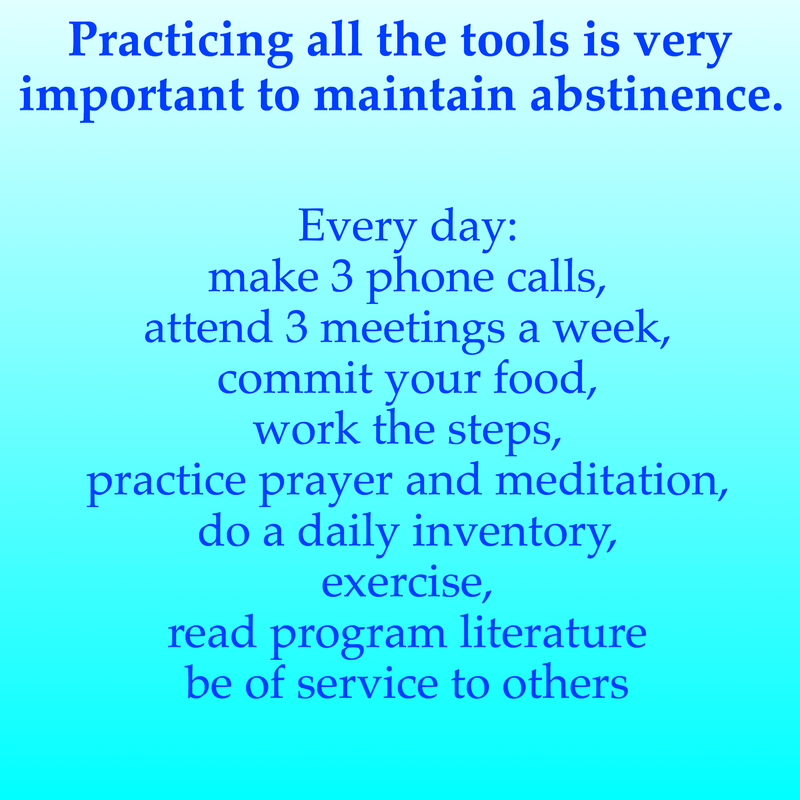 The tools are very important to help maintain abstinence. This is what my very first sponsor told me to do when I first started program. 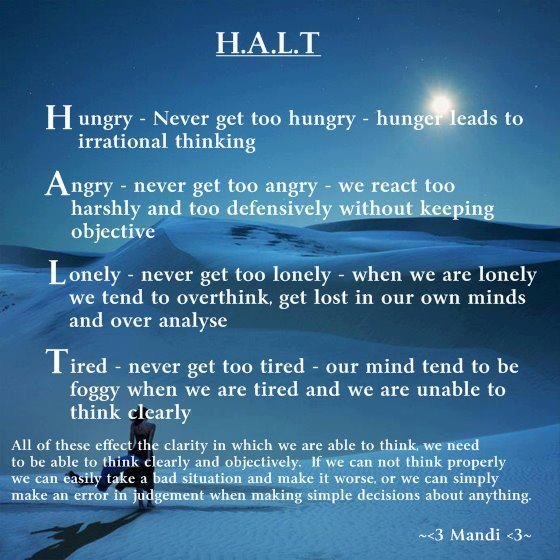 I like to use the acronym HALT: Hungry, Angry, Lonely Tired for relapse prevention. Have everything weighed and measured and know exactly what you are going to eat and have back up food available. 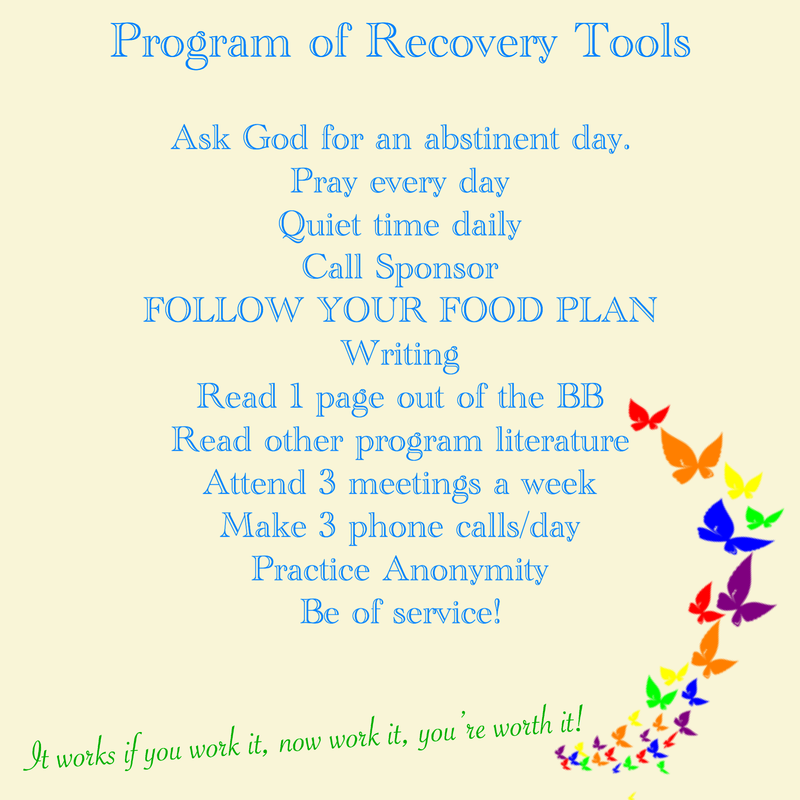 Write it down and commit it to God and preferably another abstinent person in program. However, remember, you are never alone. God is always with you! As they say, make a place setting for God, either literally or figuratively at your table. If you are going to be eating out, discuss with the restaurant or the hostess your food plan and what you can or cannot eat. 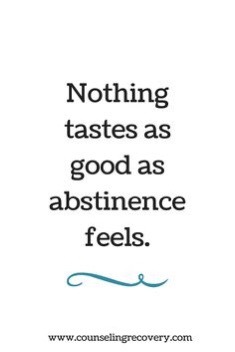 I personally always bring back up food, just in case the food served is not abstinent. Since I began program, I weigh and measure out all my food in advance. I always have back up weighed and measured food in my freezer and fresh food in the fridge for at least 2 days in advance. I also used to keep back up canned food in my car and I have back up measuring cups and spoons in my desk at work. In a pinch, I recommend salad in a bag. I also have bought grated carrots, cabbage or other vegetables, if I don’t have time to prepare a salad. For fruit, I recommend having back up apple sauce or other fruit that is canned and unsweetened. I believe that it is very important to read program literature every day. When I am away on vacation, and unable to make phone calls or go to meetings, I bring my program literature with me. At night, I write on what I read during the day. How do I relate to what is written in the paragraph? Or, make a question out of each sentence, whenever possible and write down your response. This is a wonderful way to become familiar with the AA BB (or any program literature). 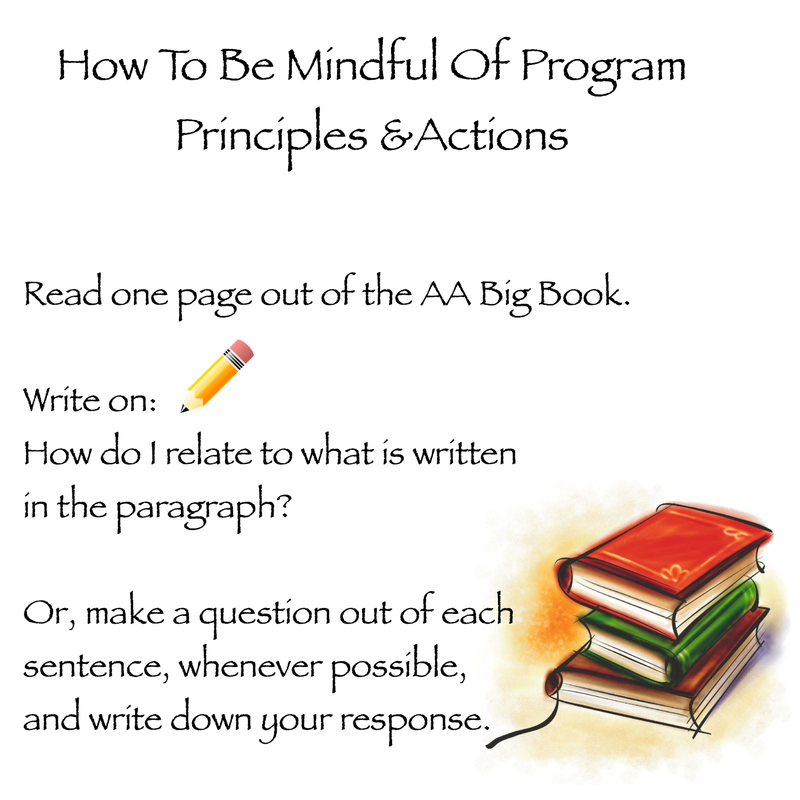 It also helps to keep me mindful of program principles and actions. I also recommend reading page 84-87, “Upon awakening” within 1 hour of waking up and “when we retire at night” before going to bed. Doing this on a daily basis is VERY powerful! Angry: Prayer and meditation are very important to practice every day to help us remain calm, sober and serene. I personally find that I need at least 20 minutes of quiet time a day. Lonely: Spend time looking for how you can help others. Try to focused on other people — genuinely connect and listen to them. During the holidays, and when you are spending time with family members that might provoke you, make time to also visit people who are supportive of you too. Remember that this is a time to enjoy your family and celebrate the special event or holiday! Tired: get enough rest and spend time every day relaxing. Formulate a check list based on those activities which best support your recovery. Finally, the name of the game is willingness. 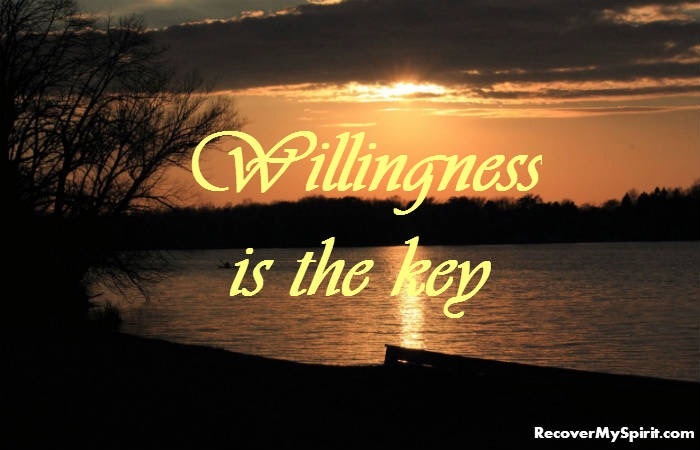 If we want to recover, we need to be willing to go to any lengths. These are just some techniques that I have learned from my sisters in program. It works if you work it so work it you’re worth it! This is great, Shira!! Thorough and well researched, as usual. 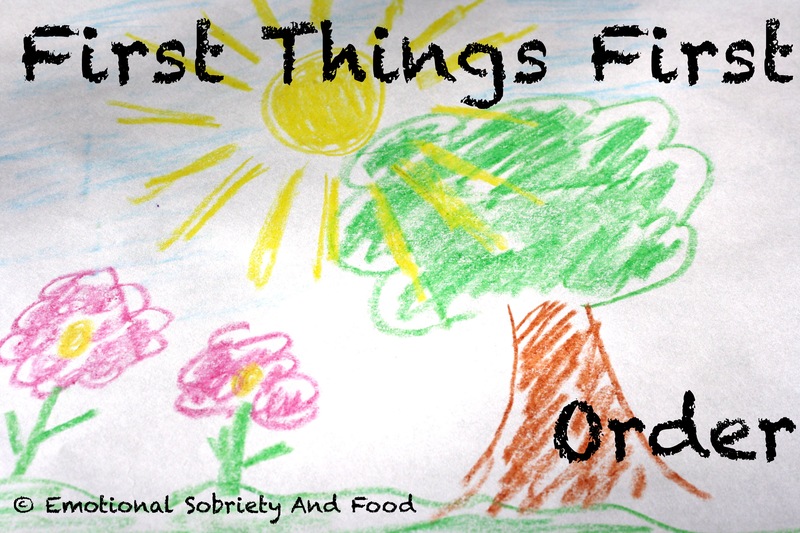 The ideas you present are essential to continued abstinence and recovery. Thank you! Thank you Aidel! I was inspired by our meeting.